Truly different, bold and confident. MANSION’s debut is damn near perfect in every way. I’m convinced we’re in an era of discovery and profound evolution in Metal as we’ve known it. It seems that every few months another band comes along and drastically raises the bar with a jaw dropping debut or release. Well, MANSION has done just that, and I’ll be damned if I didn’t discover it too late to have added it to my 2018 Best of List. Rest assured, had I known about it in 2018, it would have ranked high on my list. Not just my Metal list, but my all genre inclusive list. It’s that darn impressive. Call it Doom, or Cult Doom. Call it Occult Metal or even NuMetal. Maybe even Psychedelic to a degree. I guarantee you it’s like nothing you’ve heard before. This is about as dark, and gothic as Metal (or music for that matter) comes. Yet, at the same time, the songs are warm and beguiling. The band hails from Finland and have released “First Death of the Lutheran” via I Hate Records, following their EP release “We Shall Live”. The songs, while simple, have a depth that prevails throughout. Layered, mixed and produced to perfection, the album’s five tracks clock in at a total just bit over 40 minutes. Just enough to keep you longing for more. Opening with “Wretched Hope”, the track opens with a definite essence of fear, with sounds reminiscent of nothing short of Doom itself. Whispers lead us “away from the Lord” and begin our descent into the darker themes. Alma’s vocals, as well as the choral like backing vocals set the mood quite effectively, while Veikko-Tapio and Jaakob’s guitars slip in and out like a rabid serpent, darting here and about with riffs and striking with seductive leads. When these leads really take off, you realize there’s no turning back. They’ve got you. You’re in for the long haul. The subject matter and lyrical content can obviously be controversial for some. Yet, from an artistic perspective, the pure beauty of this album should easily outweigh any such concerns if given a chance. There’s such a fascinating creative element at work here, with the usage of the organ, unique percussion and even a saxophone. 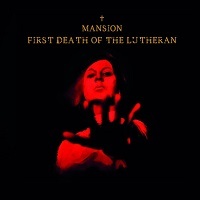 MANSION keeps you on the edge of your seat throughout, even through repeated listens. I found the album most enchanting at an elevated volume and through the use of headphones. There’s a lot happening sonically in the background, and these methods absolutely enhanced the listening experience. What a debut. Simply brilliant. Bravo.